Even as a seasoned card maker, I enjoy learning tips & tricks from other crafters. My favorite tip/trick is one that applies to all of us whether we are stampers, colorists, diecutters: create something every day. If all we do is look at our pretty crafty supplies, or run our hands through a cup of gorgeous sequins, but never use them….we’ll never learn our craft! So even on days when I make something totally ugly – I make sure I make something. With that, welcome to my stop on the Ellen Hutson Design Team bloghop! I’m so excited to be on the team! Keep on scrolling to see a pretty watercolor project, then get to the bloghop info! While wanting to do a comparison between the old and new Quinacridone Gold paints (the planet recently ran OUT of the pigment for the old one, and Daniel Smith engineered a replacement)….if you know me, I got bored just doing swatches. Let’s paint something! How about tulips, since Easter and Mother’s Day are around the corner? Watch the video below or click HERE to see it in HD on YouTube. Hope you found these tulips bringing a little sunshine to your spring – Easter and Mother’s Day are on the way! The watercolor class mentioned on the video is here – click to go see more details….the class is on a special sale THIS WEEKEND ONLY! Coffee or tea? Oh goodness, neither. LOL! I live in the Seattle area and don’t drink either, can you believe it? Tell us one silly/random/interesting tidbit about yourself! There are soooooo many! A recent one…I like to play along with random challenges on the interwebs from time to time. And while I was on vacation, I saw one on twitter that I couldn’t resist: it’s called the #hobbylobbychallenge but lots are doing it at whatever store is in their area. The idea is to go to the florals section and take dreamy pics that look like they’re in a garden! I got laughed at while I was there, but figured, what the heck, I’ll never see these folks again, right? Here are the ones I took! I shared a little about why I’ve joined the team earlier this year…see the video HERE…..and now the hop list! Always love your watercoloring, chica! OK, the hobby lobby challenge story? CRACKED ME UP!!! Laughed even harder, knowing the story, when I saw you in your faux garden because the challenge is hysterical to me! Way to hair-flip the stares and do it anyway! Atta’ girl! While this is a pretty Spring card, I enjoyed (and continue to practice) the watercolor “exercise”, so thank you for that. This is incredible! You really understand how the paint works, the water … thank you for sharing this! Ahhh … I finally figured out how to leave a comment on your blog! =) LOVED this video, Sandy, as one of my favorite flowers are tulips (they were in my wedding bouquet!). I will definitely check out your other flower videos! I’m so thrilled to finally be on a team with you … I look forward to your wonderful inspiration! Thank you so much for all the wonderful things you do and thank you for the encouragement to create! You are a very special person Miss Sandy and I’m so glad to be on this team with you!!! 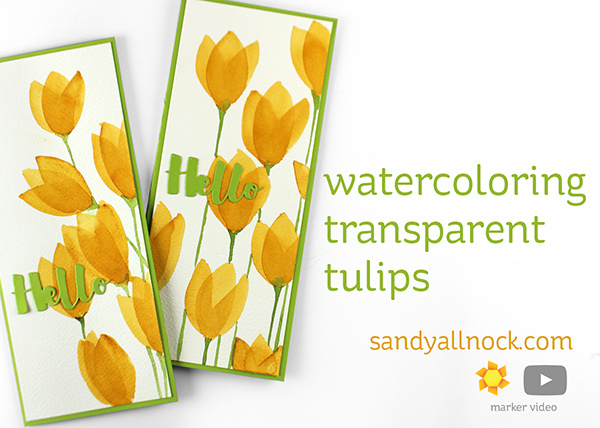 I just love these fresh, springy tulip cards, Sandy! At first glance, I thought the petals were made from vellum! lol. Very pretty! So glad you’re on the EH team! Your work is so amazing. I can watch your videos all day!!! I am very partial to yellow so these beauties speak to me. I remember in art glass gluing tissue paper, how they looked so transparent. Nicely done. I cannot wait to try this Sandy. You are so amazingly talented and teach us so much. Thank you. Sandy, I never ceases to be amazed by your gorgeous work. You are such a talented and creative lady. Your tulips are stunning. I am so happy to be working with you on the Ellen Hutson team. We have such a talented group of designers and it is so fun to see all the different paper crafting styles. Love how such a simple shape can make such pretty flowers! Will have to try the tape trick on my next die cut! I love your happy yellow tulips. You are always an inspiration and I learn soo much from you! I am also very excited that you are on the EH team and I agree with you, I think she is a true inspiration. Thanks for a great video. Always learn something from you. I’m trying to be more relaxed when I watercolor and trying to lose that feeling of panic when brush, water, watercolor paint and paper come together! LOL! Love these tulips and the beautiful cards you created. Pretty spring cards! I always love watching your technique tutorials! Those are so beautiful! My mother-in-law loves tulips and her birthday is coming up. I know what I’m making for her! Thanks for sharing! Beautiful card. Thank you for the video. I can almost smell spring when I see this awesome card! 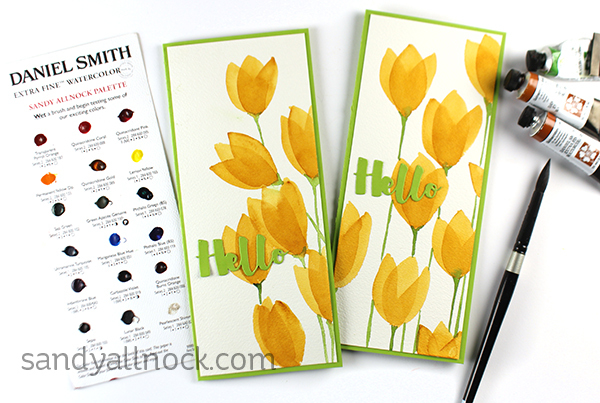 Thanks for this gorgeous tulips and great watercolour tutorial! So very pretty. Here’s pup story for you. Our dog tore his ACs and I was trying out all types of supports for him. I’d gotten braces online but they slid down so I made a harness over his back and connected it to a strap across his chest to keep it all together. He was so patient and put up with all my foolishness. One day after I had him all trussed up and bound I let him outside. When I looked out later he was laying in the middle of a bed of daffodils. Completely crushing the majority and looking very satisfied. He never had done that before nor did ever do it again. I believe he was making a point. Beautiful as always, Sandy. You are one talented lady! Lovely spring card! Thanks for the reminder about doing something creative every day! I often allow being busy or waiting for a creative idea to stand in the way of creating and I think making time every day is what really nurtures creativity. Beautiful, as always! Your projects always inspire me to want to be a better watercolorist. 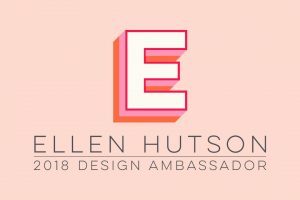 So excited to be on the Ellen Hutson team with you! and TULIPS? my favorite bloom! Sandy, I can’t believe you did the Hobby Lobby challenge, Oh my… This is the first I am hearing you did that, LOL. So happy to be on this amazing team with you – I have followed you forever and learn so much from your work! Love your dreamy garden photos! Beautiful yellow [my fav] tulips! Your video and instructions made everything look so easy so I guess I’ll have to give this a try. so pretty and perfect for Spring.